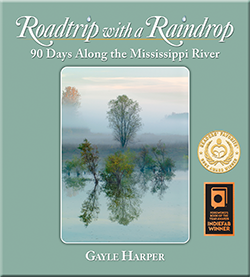 If you’ve been able to follow the adventures of our little raindrop on facebook.com/GayleHarper.MississippiRiver or other social media (which I’ll list at the bottom), you know that it’s been a VERY exciting launch so far! There have already been seven different Book Signing/Presentation Events, all of which were wonderful. Sharing these stories and hearing how hearts are touched is SO much fun, it sometimes feels like my heart just might explode with Joy. 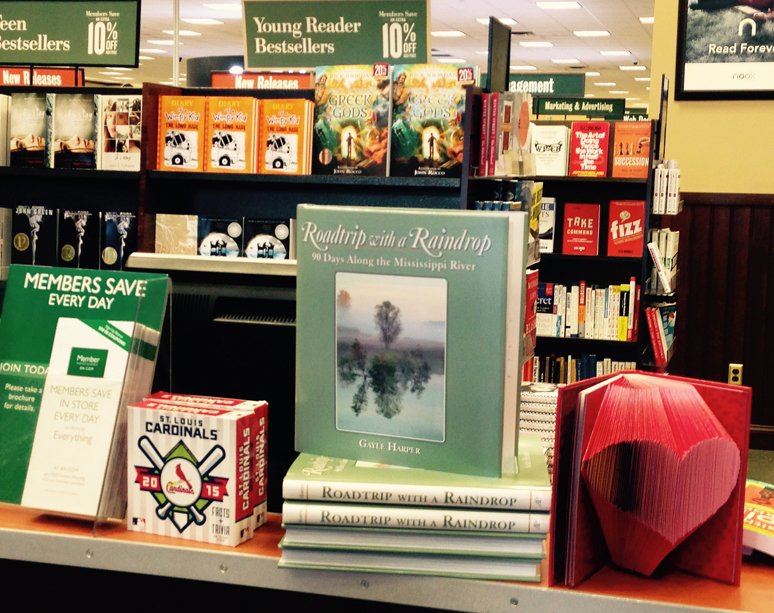 On Saturday, Barnes & Noble said “Bring us more books! We are sold out and people are asking for them.” I did – and on Sunday when I walked in to find they had made a display of Roadtrip with a Raindrop right up front at the Information Counter, it brought one of those crystallized moments of pure gratitude and humility. I feel like the luckiest person in the world to be involved in this amazing project! There’s been lots of GREAT media coverage too (and it’s from word of mouth as this is the “soft launch” and we haven’t done News Releases yet). I’ll update the “News” section of the website with links very soon. WHEREVER you choose to get yours, it would be a GREAT help if you would make a “Reader’s Review” on Amazon and/or Barnes & Noble. It’s easy and no purchase is required. Readers DO value your opinion greatly! Thank you! Thank you, my friends, for traveling with Serendipity and me! Know that, however noisy or quiet this Holiday Season may be for you, the same underlying Love and Peace is always present for all of us. May your heart be filled with that. Just a quick note to let you know there was a nice article about your book in last Wednesday’s edition of the Keokuk Daily Gate City. It was written at the request of Kirk Brandenberger with the Keokuk Tourism Board. If you’d like a copy, I could mail it to you. Just let me know. I’ll be doing another article when the time for your visit to Montrose is set. Best wishes for all the best in the New Year!